Since time began many important civilization have inhabited the coastlines of the continents. Many of them have been lost over the centuries and only recently re-discovered. Previously unaware of the extent to which ancient history has been buried under tons of water, scientist are surprised at the magnitude of their findings. These ancient ghost towns are now telling secrets long towed away by the tide. Contemporary equipment like sonar, has given them a peek into these missing worlds. Through sonar mapping, divers are able to collect data that otherwise would be buried under sand and millenniums of ocean sea life. Scientist use two types of sonar to map the sea floor. To measure the depth, sonar waves are pinged from the bottom of the boat to the sea floor and back. The result is an echo. By measuring the amount of time it takes for the sound to travel from the boat to the farthermost depth, a calculation is then made in meters or feet. This is known as Multibeam. These depth measurements are then used to create maps. The maps are color coded to show the difference in depth distances. Generally the color red is used to indicate the the more shallow areas and blue and purple are used to signify deeper depths. Maps need to be multidimensional and therefore another form of sonar is used along with multibeam when getting an more accurate picture of the sea floor. It is called Side Scan Sonar. 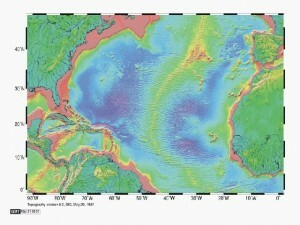 This type of scanning creates a picture of the sea floor for the purposes of mapping terrain. With side scan sonar the images are created by how “loud” the return of the echo is and essentially paints a picture. Rocks and hard surfaces reflect a louder return signal. Areas with loud echos are darker than areas with “quiet” echoes. Objects or features that rise above the sea floor will cast shadows where no sound hits. When mapping, the size of a shadow can help determine the size of a feature. The mechanism is towed behind the boat and its data essentially identifies underwater objects for further study. Towns and cities have been discovered dating back 1,200 BC and have left a bounty of archaeological treasures. How did people live and die, how did the city come to its final end, what was its main source of commerce? Questions arise and only clues are given. With mapping a three dimensional likeness can be constructed and studied more objectively giving us more answers to the unending questions. Pavlopetri, Greece which sank off the southern coast of Greece approximately 5,000 years ago. Discovered in 1967 it shows a very modern style city. Port Royal, Jamaica which was a haven for pirates with a story that fills books was reportedly sunk to the bottom of the sea in 1692 after a severe earthquake. Dwarka, India once considered just a myth, this city was discovered in the murky depths off the coast of Gujarat in the year 2000. It has been under water for nearly 2,000 years. Yonaguni, Japan reveals a great underwater pyramid mapped out to show features very similar to other pyramids built by the Mayans in central America. Villa Epecuen, Argentina may be the most recent town to have found it’s future in watery depths. Inhabited in the 1970s it was overtaken by rising waters from Lago Epecuen. When diving the ruins, signs of modern life like playgrounds and utility poles are still in evidence. Maps already exists for this local and sonar mapping at this point would be used to learn more about the environmental causes for this natural disaster rather than about the town itself. Mapping the watery depths of our world begins to give us a more complete history of our planet and our ancestor who have inhabited it. Mapping antiquity brings a richness of life to a world long dead. Please leave a comment below if you found this article of interest. It would be great to hear from you.